Tayasal is a pre-Columbian Maya archaeological site from the Postclassic period. The site is in the southern Maya lowlands on a small island in Lake Petén Itzá. This island is now part of the Department of Petén in northern Guatemala. Tayasal was the capital of one of the last independent Maya polities to be conquered by the Spanish conquistadores and colonizers, along with Zacpeten (the capital of the Ko'woj Maya) and Eixequil (the Yalnain capital), in 1697. As an archaeological site, it was heavily damaged by the Spanish after its fall. 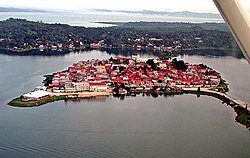 The capital city of the modern Petén department, Flores, has been built over the island and the nearby shores of the lake. The Itza left the Yucatán region in the 13th century and built the city later known as Tayasal as their capital. They called it Noh Petén, or literally "City Island". It was also called Tah Itzá, or Place of the Itzá. In 1541, Hernán Cortés came to the island, on route to Honduras, but needed to move on and did not try to conquer it due to its very good defensive position. The Spanish were not able to conquer the island until 1697, after several attempts, that begun in 1629, when they marched in, from Corozal in Belize, Yucatán and Alta Verapaz, attacked with boats, and destroyed it. Many Itzá people hid in the jungle for years. The structures of Noh Petén were turned into the Roman Catholic Church and other buildings in the city of Flores. This page was last changed on 24 October 2015, at 23:00.